WARNING: This post has nothing to do with neither beer nor books. 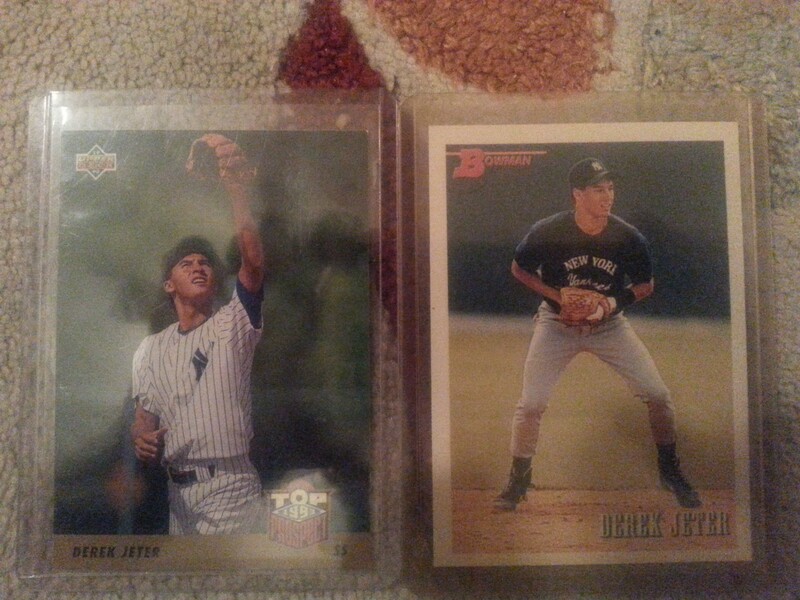 I was recently sorting through my old baseball cards and couldn’t resist making a quick post about the experience. For someone who didn’t collect I’m not sure I can adequately explain to you the joys of flipping through 100s if not 1,000s of mid-to-late ’80s and early ’90s baseball cards. But for those who did, I’m sure you know what I’m talking about. All those memories of opening up packs as a kid. The thrill of the hunt and the excitement when you finally got that card you were after. The nostalgia of coming across all those players you used to watch, superstars and near-forgotten journeymen alike, smiling at you from cardboard photos taken when they were younger than you are now. Remembering that Barry Bonds, Mark McGwire, Alex Rodriguez, and Manny Ramirez were once thought of without any asterisks attached. Realizing that we’ll probably never see two-sport professionals again, nevermind All-Stars like Bo Jackson and Deion Sanders. Remembering what it was like watching the game as a kid, when it was just a game to you. Like that card of Brian Downing that reminds you of that cold April night you saw him launch a home run over the Green Monster, against a steady wind and nearly freezing drizzle. And a postcard of Fenway reminding you that home run went over a wall without ads or luxury seating on top of it. Recalling that at one point in your life you knew way too much about your favorite player – mine was Nolan Ryan as my mountain of his cards from 1969 through 1994 can readily attest. I could easily go on, but instead I would rather share some of the highlights of what I uncovered. Having just missed out on the craze around finding error cards, rookie cards and later on limited inserts were the big draws of my collecting days. Looking at these cards now, I found myself significantly more interested in the rookie cards, now having the advantage of hindsight to see who made it. There some busts (Todd van Poppel), some tragic stories (Brien Taylor), and some that lived up to the billing. This post is focused on the latter. 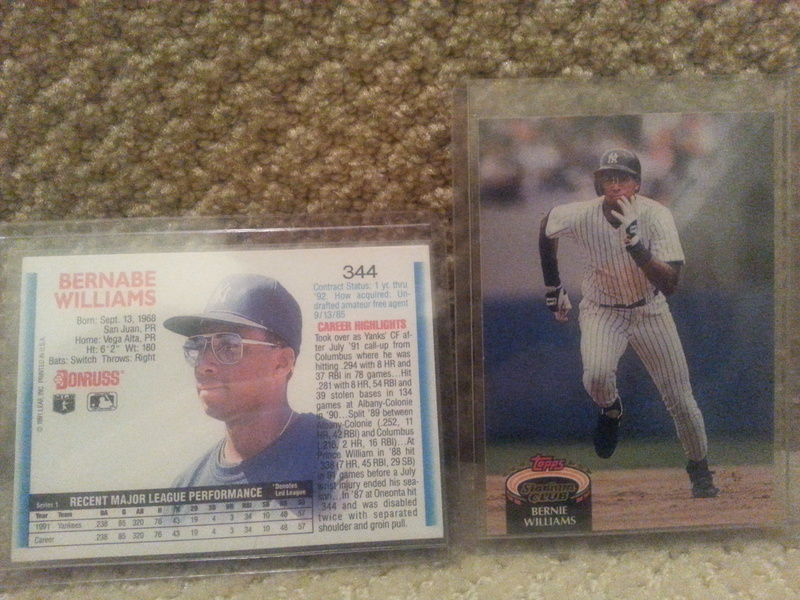 Since I am a Yankees fan despite my Boston upbringing, I’ll open with a few near and dear to me. 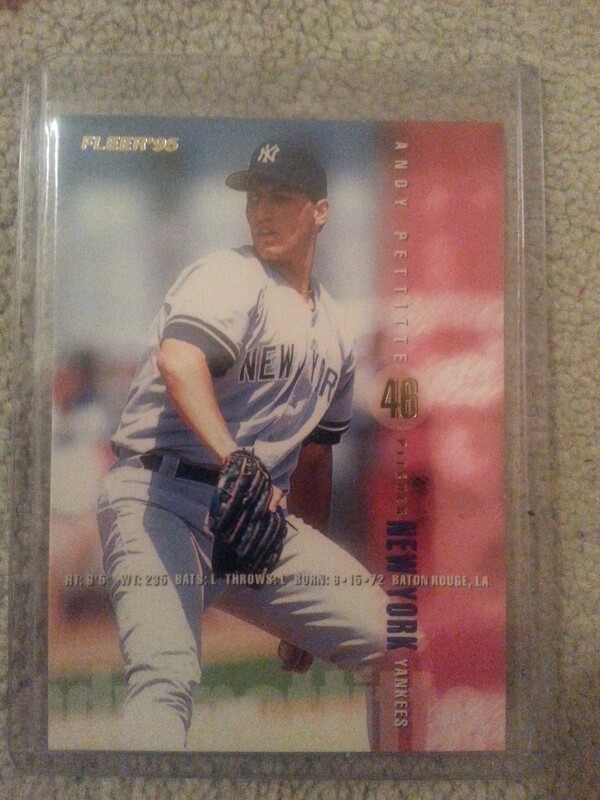 Nice first year cards for one of my all time favorite Yankees. I think that whole “Core Four” media creation really short-changed the contributions of Bernie and Paul O’Neill, but I digress. Back to the cards, you have to love those aviator glasses and rare reference to him as Bernabe! I’ve talked quite a bit about the Night Shift Barrel Society beers on tap so far here but haven’t really gotten into the bottles too much. The other day I was looking to treat myself and wound up opening one of my 2014 Barrel Society beers. 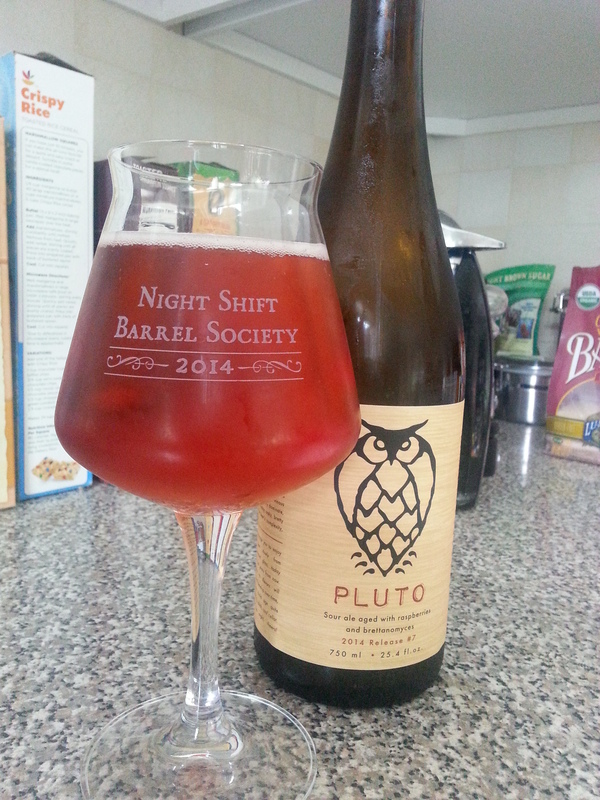 Pouring this time was Pluto, the final release of the release of the 2014 lineup. The first and last time I got a chance to try this beer was back at the beginning of the year when I thought it was a good and that it might prove interesting with some age on it. Let’s see how it did. Description: A sour ale aged with raspberries and brettanomyces. Lots and lots of raspberries. Bottled on 12/23/2014. Pour Info: Poured from a refrigerated 750 ml bottle into a snifter glass. Appearance: Pours a pinkish golden orange with a lively and fizzy white head. Smell: Sweet berries with just a hint of the tartness to come. Taste: Lots of raspberry tartness upfront, followed by sweetness that transitions into a bretty funk that peaks at the finish. Compared to my first tasting, I would say the berry tartness remained high while the funkiness picked up a bit. The beer certainly aged well and perhaps even improved itself a bit. Mouth Feel: On the thicker side of medium, perhaps a bit more than I recall, and a bit bubbly. Complements the beer nicely. Overall: I really liked this beer and found it a worthy addition to the Barrel Society lineup. Fruity sours are a style Night Shift really does quite well and with a little bit of age on it I think this one is now a step above their seasonal Weiss series. I had some time to kill last weekend so I took a little trip across the orange and red lines to Cambridge Brewing Company. This is an awesome brew pub that has been putting out some excellent beer for over 26 years now. While they don’t seem to get the same hype as some of the newer guys, make no mistake about it: this place is legit. They offer up a wide variety of excellent house beers, good eats, and even wine for the non-beer drinkers that come through their doors. Being a bit of hike to get there using transit I don’t visit frequently, but when I do it has always been worth the trip. This time was no exception. Since they had about a dozen different beers pouring that day, I went with a pair of flights to make sure I got to try at least a sample of everything that caught my eye. So here we go with flight number one. Starting from the left, I began on the hoppy side with Double Dry Hopped Tall Tale Pale Ale. It poured an innocent pale yellowish-golden body, but wow was this aggressively hoppy! Resiny bitterness joined forces with citrus zest to make this one intense Pale Ale. Checking in at 5.7%, this was a solid beer that should satisfy the hop heads out there. The next beer in line was BRAAAAAINS!, a 5% Session IPA brewed with shredded pumpkins and a healthy heaping of hops. This beer was a bit more balanced than the previous one, with a more moderate pine and citrus hop bitterness backed by hints of wheat, malt, and ever so subtle pumpkin. Beer number three was called Brett Semetary, and it has back story as interesting as its name. Last year on Halloween they put a batch of their Great Pumpkin Ale in an oak barrel with some Bretanomyces and kept it there until breaking it out for Halloween this year. The result was a sweet, deeply funky brew with hints of cinnamon and pumpkin spices. The near hay-like funkiness comes on pretty strong up front, blends with a bit of oak, and comes to more mellow end. Smooth to drink with a slightly syrupy finish, there was a lot going on with this beer, and all of it was good. Too bad I already finished my pumpkin beer rankings! Rounding out the flight was a Wild Ale called Family Meal, which they list as having been aged with both Brettanomyces and Lactobacillus. It poured a deep amber, almost red-wine like body. The taste was primarily sweet dark fruits with a wonderfully funky, tart backing. It was really easy to drink at 6.0% and it was probably my favorite beer of the day. I started the next flight off with something a bit more traditional, their Cambridge Amber. This beer was quite solid in its own right and was a shining example of what a non-hoppy Amber Ale should be. It poured the color you’d expect and presented a pleasing blend of toffee and caramel malts before coming to a slightly roasty finish. Super smooth to drink, an easy choice if you’re looking for a pint. Next up was the strongest beer of the day, an 8.5% Bourbon Barrel Aged Old English Ale dubbed Old Butternuts. Brewed with squash, this was a very rich and malty beer with a slightly hot, oaky finish. Personally, I was not as fond of this beer and thought it had too much oak for my tastes. I will say that it was getting praise from some of the other customers at the bar, so don’t let me scare you off of it. You know what you like. Following this came The Brett Conspiracy, another Wild Ale. The story about the yeast strains used in this beer on the company website is interesting and worth a read, but for my purposes here it was a delicious golden bodied ale that drank a bit thicker than I expected. The taste was dominated by tropical fruits and the clear influence of all that wild yeast, though there was also a bit of a grainy backbone that held these flavors together really well. I’d say that this was my second favorite, edging out Brett Semetary for that distinction. I finished the afternoon off with a Saison barrel-aged with Brettanomyces called Barnyard Bash! The funky fruity smell of this beer offered only a hint of what was come after taking the first sip. It had a tart fruit and bold hay blanket taste that came on strong. I was OK with the sample but I’m not sure I would go for a larger pour of it than that. It was much lighter bodied than the rest of the beers in this flight and the low/moderate carbonation in theory made it easy to drink, though I think this one was almost too funky for me to handle. 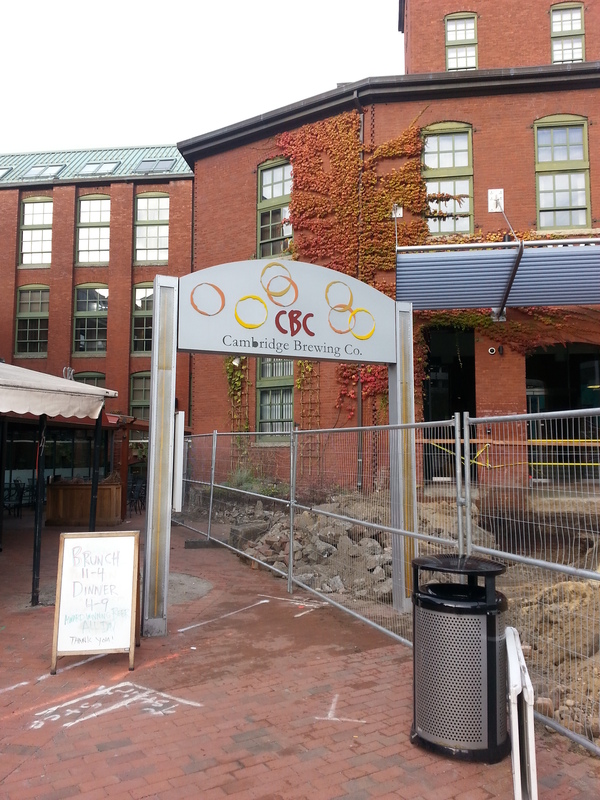 That concludes my trip to Cambridge Brewing Company. I had a great time checking out some amazing beer and everything sampled I found to be very complex, well developed, and perfectly executed. Family Meal, Brett Semetery, and The Brett Conspiracy were particularly fantastic and get my highest recommendation. Even the two I didn’t like as much, Old Butternuts and Barnyard Smash!, I wouldn’t necessarily call misses. From reading the descriptions online, I think they totally nailed what they were going for, they just stylistically were not for me. 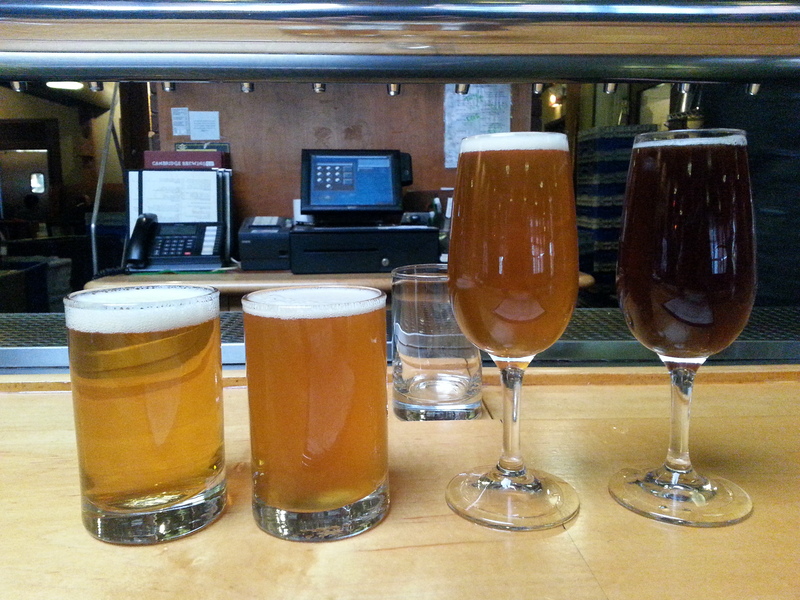 In short, Cambridge Brewing Company offers a wide variety of really good beer that you need to come in and check out. 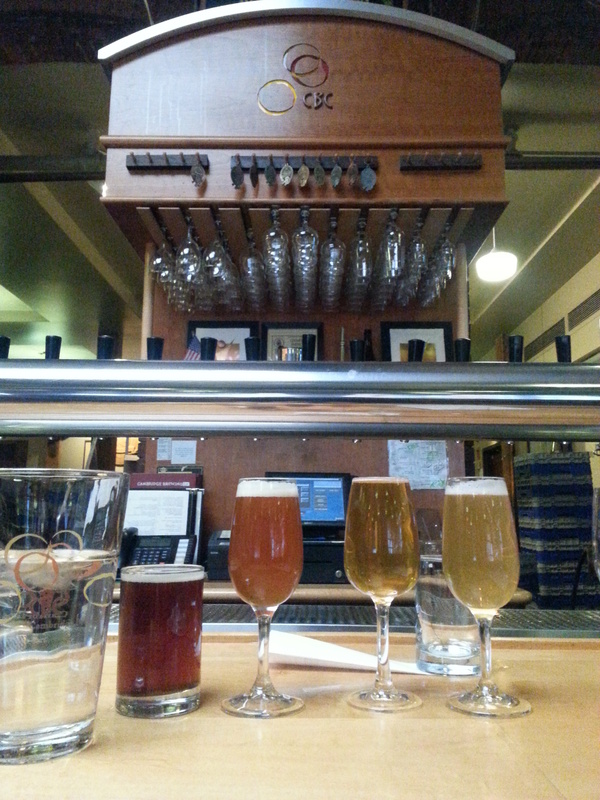 From their finely tuned core lineup to some serious Wild Ales they are an excellent part of the local beer community. With another Halloween come and gone, it’s time to put the pumpkin beer tasting to rest. This is usually a particularly thirsty holiday for me, and this year was no exception as that final blind tasting I had planned didn’t pan out. My final three pumpkin beers were consumed the old-fashioned way, known and from a pint glass. I have included them in the rankings below, so they still do get their chance to be a part of the experience. And what an interesting experience this was. There sure are a lot pumpkin beers released this time of year and it’s not hard to find a wide variety of options. A few of these options are really good, some are pretty average, and a number of them are not so great. There were times I got discouraged as the not so great ones seemed to be ganging up on me and I now have a greater appreciation of why people sometimes roll their eyes at the whole idea of pumpkin beer. While I am not at that point, I do think that next year I will be more selective in my purchases and go with known favorites or offerings that are of particular interest (more stouts please). The benefit of all this was that now I know exactly what I like in a pumpkin beer: sweet malts, vegetal pumpkin, and a subdued spice presence. So while it wasn’t always great, I really did enjoy doing this and might have even learned a thing or two. But that’s enough rambling, below are the results! All the beers in this category were my favorites and ones that I am certain to actively look for and pick up next pumpkin beer season. Cape Ann Brewing Company – Imperial Pumpkin Stout: For the second, perhaps even third, year running this has been among my favorites. It’s a bit sweeter than the rest, but it tastes so good. I’m tempted to try and find some more to drink this winter and maybe even save for a vertical tasting. Harpoon Brewery – Pumpkin UFO: This beer was the star of the blind tasting rounds and ranked rather favorably (upper second tier) last year. Sweet, vegetal tastes with just a subtle hint of spices is my preferred flavor profile and this beer delivered just that. Also doesn’t hurt that it’s also readily available for a good price in my area. Cisco Brewers Inc. – Pumple Drumkin: Another repeat favorite. While I don’t think it had the same excitement for me this time around as it did last year, it was still a very good beer and my only hop fix in this contest. Cambridge Brewing Company – Great Pumpkin: One of the few beers where I really appreciated the fall spices. Very balanced and complex. Quality brew. All these beers I enjoyed, but not quite as much as the previous tier. These are the ones I would still order on draft, take to a party/have on hand for guests, or recommend to a pumpkin beer newbie. Dogfish Head Brewing – Punkin Head: A solid beer, this one pretty much defines what a pumpkin ale should be. Not quite as exciting as the ones listed above, but a good choice none the less. Brooklyn Brewery – Post Road Pumpkin Ale: It needed a good amount of sweet malts to keep the finishing spices at bay, but this was overall an enjoyable beer. Slumbrew – Slumkin Pumpkin: It’s pretty much an exclusive to the Slumbrew establishments, but if you’re in the area of either their main brewery or Assembly Row taproom at the right time of year, this one is definitely worth a try. A great example of a fall spice finish done right. These are the beers that didn’t make a strong impression. They weren’t bad, but there was nothing about them that really captivated me either. I wouldn’t pass one of these up if they were offered to me, but I wouldn’t go out of my way to get them either. Long Trail Brewing Company – Pumpkin Ale: Nice mix of malts and subtle spices. It doesn’t particularly stand out but does capture the style well. Captain Lawrence Brewing Company – Pumpkin Ale: While it did have a bit more roasty bitterness and a hotter finish than your typical pumpkin ale, these things weren’t enough to elevate an otherwise lackluster brew. Blue Point Brewing Company – Pumpkin Ale: It had all the elements of a beer I’d really like, only really muted. It was definitely an approachable beer, but not one I could get excited about. Perhaps too approachable, if that makes sense. Ithaca Beer Company – Pumpkin Ale: A touch on the spicier side but for the most part a nice balance between malts and the fall spice mix. If you like spicier pumpkin ales, you might rate this higher. These are beers that I didn’t know quite how to place. While I have strong reservations about placing them in the second tier, they were too intriguing to fit into the third tier. Think of these as beers that would be good were it not for some tragic flaw. I’m curious enough to give them another shot, but realistic enough to think they may not earn a higher ranking after re-evaluation. Lakefront Brewery – Pumpkin Lager: This one had an odd but mostly enjoyable taste. Earthy, malty tastes up front that turned to vegetal pumpkin combined with a sweet and slightly funky taste in the background. Not sure about 1) how this would hold up when drinking more than one, and 2) how intentional that funk was. I’d be willing to at least give it another try though. Magic Hat Brewing Company – Wilhelm Scream Pumpkin Ale: If going by taste alone, this beer would have ranked much higher. Unfortunately, a fairly off-putting mouthfeel dropped it down several notches. I’d be open to picking up one of these next year to see if they get that sorted out. Two Roads Brewing Company – Roadsmary’s Baby: This beer had a lot of potential that I felt it did not quite realize. A bit too much roast and vanilla for my tastes, but I would give it another chance as it did enough for me to stay out of the lower rankings. These are beers that really did not do it for me. I would not seek them out or recommend them. 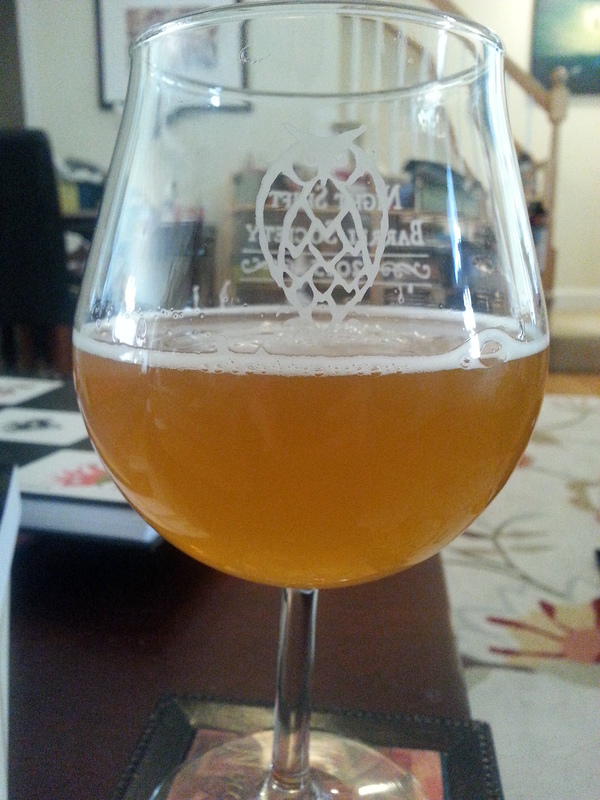 Samuel Adams – Pumpkin Batch: As a Saison, this wasn’t too bad. However, it did not taste even the slightest bit pumpkin-like so I cannot recommend it as a pumpkin beer. New Holland Brewery – Icabod Pumpkin Ale: The spices came on far too strong for my tastes and there wasn’t much else there to balance them out. That makes this a miss for me. Smuttynose Brewing Company – Pumpkin Ale: This beer tasted soapy and astringently spicy. It fared a bit better when left to sit for a bit, but I can’t say I liked this. This final tier is reserved for beers I really hated. They will be actively shunned and I don’t think I’ll ever be persuaded to purchase one again. Southern Tier Brewing Company – Pumking: Some people love this but to me it was cloyingly sweet, overly spicy, oily mess. To each their own. Fans of this beer rejoice, I’m leaving more on the shelves for you next year. Steadfast Brewing Company – Pumpkin Spiced Ale: This beer was WAY over spiced and pretty much undrinkable. I appreciate they tried to put out a gluten-free pumpkin beer option, but it would have been better to go without this one. Try their Oatmeal Stout instead. I stopped by Trillium Brewing Company last week to pick up a few treats for my Halloween festivities and see what new brews they had available. Although my original plan was to only get a growler filled, I ended up picking up a bottle as well since it sounded too good to pass on. Turned out to be a good choice as both beers were excellent and earned themselves a write-up. I started Halloween off right by cracking open a growler of Artaic shortly after breakfast. Artaic was an 8.5% Double IPA hopped (and then dry-hopped) with Mosaic and brewed with wildflower honey. It poured a hazy golden-yellow body with foamy white lacing up top. It smelled sweet with a dank bitterness and something else that was almost but not quite smokey mixed in. That last part confused me a bit, but the taste put that thought aside in a hurry. It started out with an aggressive resiny bitterness, then sweetened up with notes of citrus fruits and honey, and came to a piney sap-like finish. Like a lot of great Trillium beers, the hops were out in force for this one. Mouthfeel was pretty typical for the style, smooth medium body with carbonation perhaps just slightly on the higher end of moderate. This was an excellent beer to start the day with, and at a roughly $12/32 oz. growler, something I would definitely look to pick up again. The bottle I somehow didn’t get around to drinking until after the weekend had come and gone. 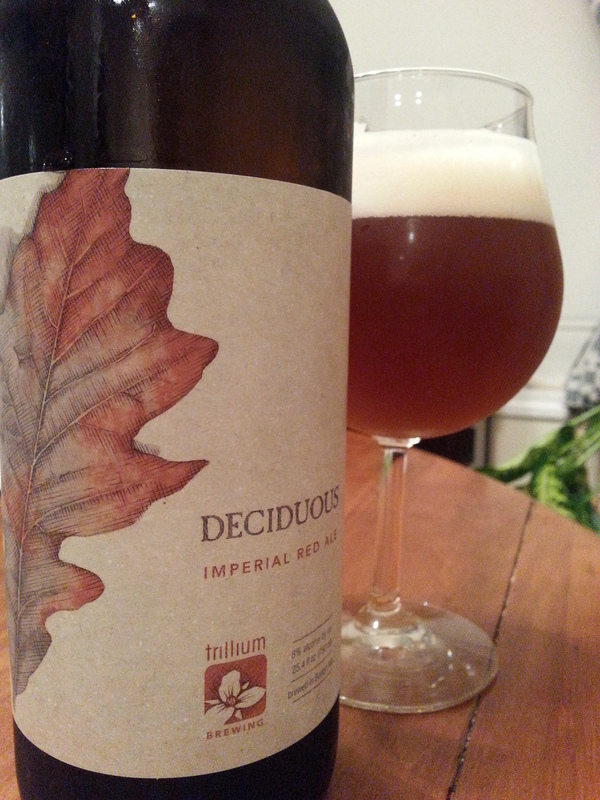 This one was Deciduous, a 8.0% Imperial Red Ale. As I’ve mentioned before on here, this is perhaps my favorite style of beer and I was eager to see how this one turned out. It poured an amber/brown body that was really similar in appearance to a dark apple cider when held to the light. With only a little bit of coaxing it produced a one to two finger foamy off-white head. The smell was an inviting mix of sweet malts and piney hops. The taste offered more of the same, but with some complex additions. It greeted me with a subtle-yet-noticeable blend of caramel and candy-like sweet malts, which were followed by a bit of citrus zest before the hops started to pick up and carry the beer to resinous, piney finish. The mouthfeel was a touch thicker and creamier than your typical IPA with moderate carbonation. All in all this was another excellent beer and a great example of the style, ranking among my favorites. If the malt presence was dialed up just a little bit more this would have been my vision of a perfect beer, but I would certainly not let that stop me from getting as much as I could of this at my next opportunity, especially at $10/bomber. Well, that wraps things up for this entry. Two more excellent beers from Trillium. Until next time, cheers!